If you are trying to achieve a 5 star energy rating, garage door insulation might be one of the extra measures you can take to help achieve it. When a garage is attached to a home it can be a major contributor to heat loss and gain, also making your garage an unappealing workspace in extremes of weather. Whether you're converting your garage into a home office, bedroom, rumpus room, or just want to improve the insulation on your home, and save money on heating and cooling, then insulating your garage door is quick, cost effective and easy to do. Garage door insulation kits are readily available, as the insulation is easy to install and mess free. It can be used on sectional, tilt and roller doors, all without adding weightor impeding the use of your door. All you need are the measurements of your door so that you can select the right size DIY garage door insulation kit. It is also used in walls and for ceiling applications.There are varied forms of this 'rigid insulation' the preferred style now being the concertina-style batts / sheets which give added insulative value because of their extra thickness and the air gap between the two sides of the sheets. It is most effective in hotter climates as it blocks radiant heat transfer across walls or from ceiling spaces into the house. It is moisture proof, as well as being mildew and mold resistant. Installation is by being nailed, stapled, glued or with double sided tape (DIY kits). 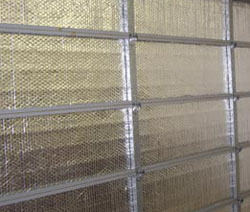 Reflective Foil Insulation can lose its effectiveness over time by dust building up on the surfaces. Exposed insulation, as in garage doors can simply be wiped down with a damp cloth.